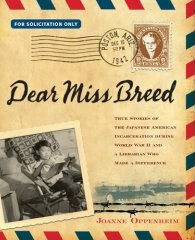 DEAR MISS Breed, my latest book, is the story of how one person can make a difference in the lives of so many others. It is also a story of courage and friendship told in the voices of those who lived through one of the darkest times in our country's history. On December 7,1941 the Japanese American children in California, Oregon, and Washington awoke as American citizens; by nightfall they had become enemy suspects who could not be trusted. War came like a hurricane that swept away their security and freedom.In a matter of months they were incarcerated by their own government, though their only “crime” was having the wrong ancestors. Four months later, to the day, on April 7, 1942, all those of Japanese ancestry in San Diego were forced to leave the only homes most had every known. Clara Breed, a young librarian in San Diego, went to Union Station with a stack of self-addressed, stamped postcards that she gave to the young people she had known since they were small children. “Write to me,” she told them, “and I will send you books and other things you might need.” For many of the children, dear Miss Breed was their sole link to the world outside the barbed wire fences in the brutal desert of Arizona. Told through their letters, diaries, and recent oral histories, the story is largely in the words of those who lived through this shameful time in our past. Their stories chronicle the past and resonate with the present as a cautionary tale.